Gold prices are recovering from Friday's correction after the NFPs positive report strengthened the US Dollar. However, the greenback is losing ground again ahead of Wednesday's minutes from the Fed despite the improved risk appetite. While investors will be closely scrutinizing the minutes, they will also keep in mind the dovish tone from Chief Powell’s speech at the annual meeting of the American Economic Association last Friday which can put more pressure on the Dollar and eases the road for the yellow metal's bull traders. Gold prices retreated from the top during Friday's session as expected after coming very close to reach the $1300 level with an over-extended upward move. The price is currently trying to break above the $1291.83 resistance level as it hovers just below it after bouncing back from the $1277.2 support level. 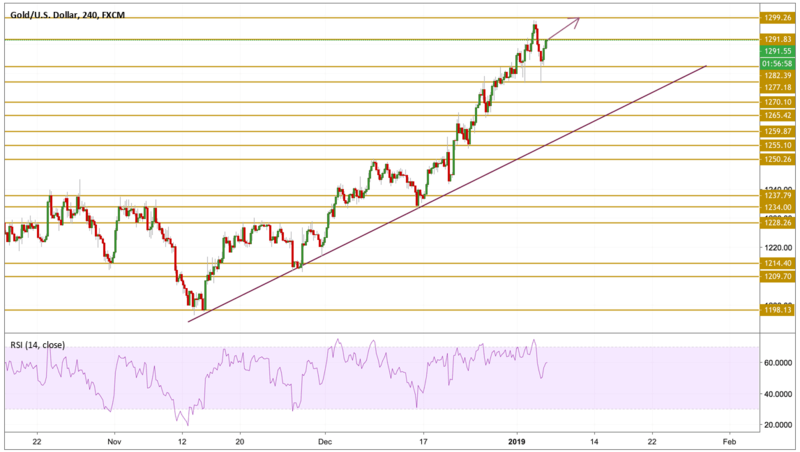 The RSI is pointing towards a relatively bullish momentum after retreating from the overbought state and now we will be focusing on the previous highs if the near resistance levels are violated.